Indulge in the elegant beauty of Chocolate by Petite Le Vian. 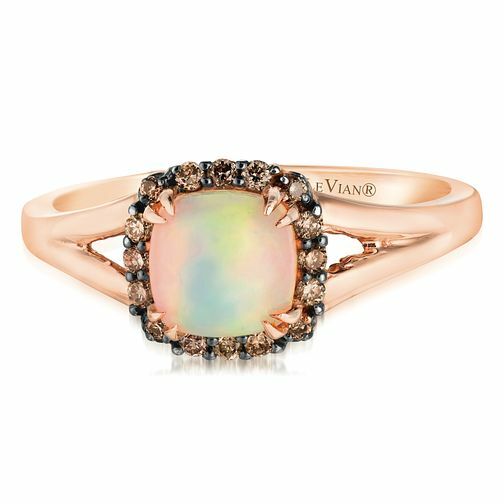 This stunning ring is crafted from sumptuous 14ct Strawberry Gold and has an exquisitely colourful Chocolate Opal at its centre surrounded by a halo of deliciously dazzling Chocolate Diamonds for breathtaking beauty and unique style. 14ct Strawberry Gold Chocolate Opal & Chocolate Diamond Ring is rated 1.2 out of 5 by 5. Rated 2 out of 5 by Anonymous from Ethiopan opal - goes yellow in water Beware of this kind of opal, it's an Ethiopian opal is notorious for going yellow when in contact with water (especially hot water with washing up liquid). It's a gorgeous ring but definitely not for me.